The term refers to tattoo subgenre Realism and to a music piece of Austrian musician Johann Strauss II called “Tritsch Tratsch Polka”, which the couple liked. 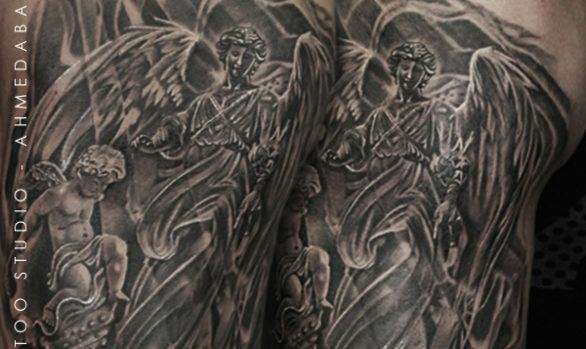 Shortened in Trash Polka by the fans and disciples, it soon caught the eyes of the tattoo and art community with its bold, even violent style. Indeed, the genre is highly recognizable and is either loved or hated. Mixing both bold and fine black lines, grey shadings and dramatic touches of bright colors, mostly red, it looks more like a collage of various elements which, by all apparences, are not directly linked, and meaningless. Realistic Trash Polka pieces often focus on realistic images, portraits coming from cinema, fashion and horror movies. Most of the pieces are showing beautiful ladies next to skulls. The perfection of those portraits contrasts with a chaotic composition, mixing blood or paint stains, drips, brush strokes and geometrical designs. Intertwined with the designs, are words, which look like letters cut from newspapers, or typewrited texts . The result is discordant yet aesthetically pleasing, reminding of the daring style of German contemporary graffiti art.